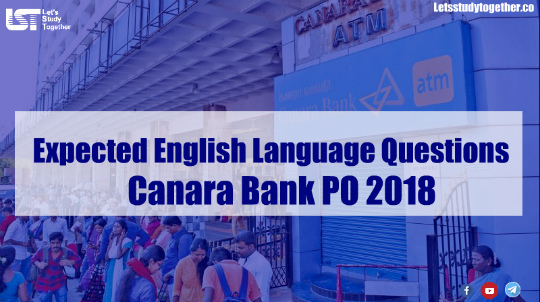 Expected English Language Questions for Canara Bank PO 2018. Welcome to the www.letsstudytogether.co online learning section. If you are preparing for SBI Clerk and Canara Bank PO exam, you will come across a section on the English Language. Here we are providing you Expected English Language Questions for Canara Bank PO 2018 for your daily practice. This “Expected English Language Questions for Canara Bank PO 2018 ” is also important for other banking exams such as IBPS PO, IBPS Clerk, SBI Clerk, IBPS SO, SBI SO and other competitive exams. In the following question, there are four sentences or parts of sentences. Identify the sentence or part of the sentence that is incorrect in terms of grammar and usage (including spelling, punctuation and logical consistency). Then, choose the most appropriate option. A. An electric fan heater maintains a temperature just above freezing point. B. Both players were suspended for the spring semester for academic reasons. C. The arbitration successfully imposed state responsibility for transnational air pollution . D. The standard technical inspection requires extensive technical expertise and was time-consuming. Replace REQUIRES with REQUIRED, because later in the sentence it is said that the standard technical inspection WAS (in past form) time-consuming. Thus to comply with it REQUIRED (past form) is required. 2. In the following question, there are four sentences or parts of sentences. Identify the sentence or part of sentence that is incorrect in terms of grammar and usage (including spelling, punctuation and logical consistency). Then, choose the most appropriate option. A. Elve was no longer at college with us, having been officially kicked out for indolence the previous year. B. I do not wish to flatter my townsmen, nor to be flattered by them, for that will not advance either us. C. The children’s faces were flushed with excitement when they saw the Christmas tree surrounded by presents. D. Information technologies are a very important and malleable resource available to executives. Replace EITHER US with EITHER OF US, because EITHER must be followed by OF if we use it before the, these, those or possessives (my, your) with a plural noun. 3. In the following question, there are four sentences or parts of sentences. Identify the sentence or part of sentence that is incorrect in terms of grammar and usage (including spelling, punctuation and logical consistency). Then, choose the most appropriate option. A. Scientists are blaming a parasite considered common in the United States for changes in the brain that result in suicide attempts. B. The singer had a sore throat so they cancelled the concert. C. I had to chastise myself for drawing pessimistic conclusions when they were trying to help. D. When I was young, my parents really had to struggle to make ends meet. 4.In the following question, there are four sentences or parts of sentences. Identify the sentence or part of sentence that is incorrect in terms of grammar and usage (including spelling, punctuation and logical consistency). Then, choose the most appropriate option. A. They have a big lunch in school so they don’t need any hot meal in the evening. B. He is sometimes upbraided by Agarn for having gravy stains on his shirt. C. The military government has agreed to amend the Constitution to allow multi-party elections within an year. D. He’s lecturing on English painting in the first half of the nineteenth century. Replace ANY with A because we don’t use ‘weak form’ ANY with singular countable nouns; hot meal in this case. 5. In the following question, there are four sentences or parts of sentences. Identify the sentence or part of sentence that is incorrect in terms of grammar and usage (including spelling, punctuation and logical consistency). Then, choose the most appropriate option. A. While I was waiting for the bus, I phoned some friends. B. The flight was delayed and we had to wait for five hours without nothing to eat or drink. C. That the government should want to tax the poor even more heavily is beyond belief. D. The best protection against illness is a good diet and lots of exercises. Replace NOTHING with ANYTHING, because Without has a negative meaning. We don’t use another negative word immediately after it, thus NOTHING (negative) will be replaced with ANYTHING which does not have a negative meaning of its own. 6.In the question, there are pairs of words/phrases that are highlighted. From the highlighted word(s)/phrase(s), select the most appropriate word(s)/phrase(s) to form correct sentences. Then, from the options given, choose the best one. (1) During the summer months, the sheep strip the mountains bare (A)/ bear (B). (2) Chester visited the beach in Kitty Hawk where the Wright brothers made their historic (A)/ historical (B) first airplane flight. (3) The revolving door remained stationery (A)/ stationary (B) because Posey was pushing on it the wrong way. (2) Historic means ‘important or likely to be important in history. (as airplanes were famous inventions thus HISTORIC will be used). Stationery refers to letter writing materials and especially to high quality paper. 7.In the question, there are pairs of words/phrases that are highlighted. From the highlighted word(s)/phrase(s), select the most appropriate word(s)/phrase(s) to form correct sentences. Then, from the options given, choose the best one. (1) Both lecturers roused (A)/ aroused (B) a lot of interest in the subject of geology. (2) According to the Bible, an angel (A)/ angle (B) told Mary that she would have God’s son, Jesus. (3) This can be seen nowhere better than in his attitude toward his adoptive (A)/ adopted (B) father Julius Caesar. (4) The bomb attacks produced a panic which reigned (A)/ reined (B) over the city. 1. Aroused means ‘make someone have a particular feeling (a feeling of interest in the sentence). Rouse means ‘wake someone up’ or ‘make someone active. 2. Angel means a spiritual being in some religions who is believed to be a messenger of God, usually represented as having a human form with wings. Angle means the space between two lines or surfaces at the point at which they touch each other, measured in degrees. 4. Reign – to be the main feeling or quality in a situation or person. Rein – a long, thin piece of material, especially leather, that helps you to control and direct a horse. 8. In the question, there are pairs of words/phrases that are highlighted. From the highlighted word(s)/phrase(s), select the most appropriate word(s)/phrase(s) to form correct sentences. Then, from the options given, choose the best one. (1) In regards to (A)/ With regard to (B) your request, we will consider the payment on Friday. (2) A couple of victories would improve the team’s morale (A)/ moral (B) enormously. (3) I hope I can meet you to speak (A)/ talk (B) about my plans for the company. (4) I forgot (A)/ left (B) my homework at home. “In regards to” is incorrect. 2. Morale – the amount of confidence felt by a person or group of people, especially when in a dangerous or difficult situation. Moral – relating to the standards of good or bad behaviour, fairness, honesty, etc. that each person believes in, rather than to laws. 3. Talk focuses on a speaker and at least one listener, and can mean ‘have a conversation’. Speak only focuses on the person who is producing the words, thus should not the sued in the sentence. 4. We use forget when we don’t remember to bring something with us, Whereas we use LEAVE with this same meaning, but only if we mention the place where we left something, thus as HOEM is mentioned thus LEFT will be used. 9.From the given options, choose the one that completes the paragraph in the most appropriate way. Anti-Romeo squads, a poll promise of the BJP, were set up the Yogi Adityanath government soon after coming to power with an aim to ensure safety of women, especially young girls. The squad had also attracted criticism from some quarters after visuals of policemen targeting young boys and girls were shown on the TV and on social media. _______. Later, however, the government issued strict instructions to the police and the anti-Romeo squads to exercise restraint, saying things like shaving of heads or blackening of face should not be done or innocent people harassed. A. The number of complaints against abuses came down instantly. B. According to an official release, 3,38,344 people, mostly youths, were let off with warnings by the squads of policemen. E. The locals were seen to be riding on a new euphoria. 10. From the given options, choose the one that completes the paragraph in the most appropriate way. Before I even begin with the technicalities, I often ask my students to first think of one good reason they want to learn the language. I tell them that unless it is something they are convinced about, the language learning experience will neither be effective nor exciting. The most common objective they come up with is, meeting the demands of the job market. __________. After some brain-storming, when they look at me with expectant eyes, I give them the example of Madhav Jha from Chetan Bhagat’s Half-Girlfriend. This example mostly works because, like it or not, they watch (if not read) Chetan Bhagat. A. And, there I see the source of all that motivation. B. While that is a perfectly legitimate reason, I prod them to look for something more personal, more immediate. C. While that is a perfectly legitimate reason, I end the class thereafter. D. This does not make sense to me. E. This shows me how gullible they are.